Stephen Alltop has built a career based on excellence in several disciplines, conducting both orchestral and choral ensembles, and performing as a keyboard artist. He is in his sixth season as Music Director and Conductor of the Champaign-Urbana Symphony Orchestra. 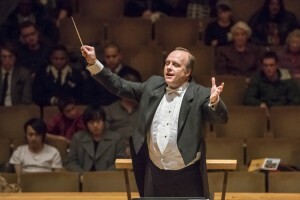 As Music Director of the Apollo Chorus of Chicago, Dr. Alltop has expanded the collaborations of the chorus to include appearances with the Chicago Symphony Orchestra, London Symphony Orchestra, Chicago Opera Theater, Ravinia Festival, Peninsula Music Festival, Josh Groban on Tour, and The Oprah Winfrey Show. He is the ninth Music Director in the 146-year history of the chorus. Also Music Director of the Elmhurst Symphony Orchestra, he was named 2012 Conductor of the Year by the Illinois Council of Orchestras for his work with that orchestra. Dr. Alltop serves on the conducting faculty of Northwestern University. A specialist in oratorio performance, he has conducted over 100 oratorio and operatic masterworks. In 2014, he conducted the world premiere of Chapel Music by Joseph Schwantner, written for the 50th Anniversary of Alice Millar Chapel. Dr. Alltop also collaborates with the Kellogg School of Business each year to do presentations on leadership for executives from around the world. From 2000 to 2008, Dr. Alltop was the Music Director and Conductor of the Cheyenne Symphony Orchestra in Wyoming. Since 2004, he has served as Music Director of the Green Lake Choral Institute. He has performed with many leading musicians and actors of our time, including Hilary Hahn, Orli Shaham, Tony Randall, Martin Sheen, and Brian Dennehy. Dr. Alltop has guest conducted numerous orchestras and choruses across the United States. In 2013, he led Brahms’ Ein deutsches Requiem in Busan, South Korea, for the International Schools Choral Music Society. He has conducted opera and orchestral concerts with a number of Italian orchestras, including I Soloisti di Perugia, Fondazione Arturo Toscanini (Bologna), Teatro Reggio Orchestra (Parma), Festival Mozart (Roverto), Orchestra Sinfonica (Bari), Teatro Piccinni (Bari), and the Festival Duni (Matera). He has worked closely with leading composers of the day, including residency projects with John Corigliano, Eleanor Daley, Janika Vandervelde, and Eric Whitacre, and has conducted world premieres of works by John Luther Adams, Jan Bach, Françoise Choveaux, Frank Ferko, Fabrizio Festa, Ricardo Iznaola, Stephen Paulus, Giancarlo Scarvaglieri, Alan Terricciano, Hiroaki Tokunaga, and many others. In 2007, he made his Carnegie Hall debut conducting music of Eric Whitacre. As a keyboardist, Dr. Alltop has appeared with the Chicago Chamber Musicians, Chicago Symphony Orchestra, Grant Park Symphony Orchestra, Joffrey Ballet, Lyric Opera of Chicago, Omaha Symphony, Music of the Baroque, Ravinia Festival, Milwaukee Symphony Orchestra, and Minnesota Orchestra. He made his Chicago Symphony Orchestra subscription concert debut as a harpsichord soloist in April of 2009 with conductor Pinchas Zukerman. Dr. Alltop has served as principal organist for Soli Deo Gloria’s Chicago Bach Project. In 2011, he was principal organist performing Bach’s St. Matthew Passion with the Ensemble Orchestral de Paris and conductor John Nelson at the Basilique de Saint-Denis in France. In 2014, he coordinated and performed for WFMT’s Chicago Bach Organ Project, a live performance series of the complete works of J. S. Bach. In 2015, he coordinated and performed at the WFMT Bach Keyboard Festival, an 11-concert series of the complete keyboard pieces of Bach. His performances have been broadcast on Medici TV, RAI Italian Radio and Television, and the WFMT Fine Arts Network. His recordings can be found on the Albany, Cedille, Clarion, and American Gramaphone labels. Stephen Alltop is represented by Joanne Rile Artist Management.